Insulate your attic or cathedral ceiling with Owens Corning's EcoTouch® PINK® FIBERGLAS® Batts - Canada's No. 1 insulation. Enjoy the comfort and savings of EcoTouch® PINK® FIBERGLAS® Insulation in your home. Remember, the greater the R-Value, the greater the insulating power. And not only will you save money, but you will help reduce the greenhouse gas emissions of your home. 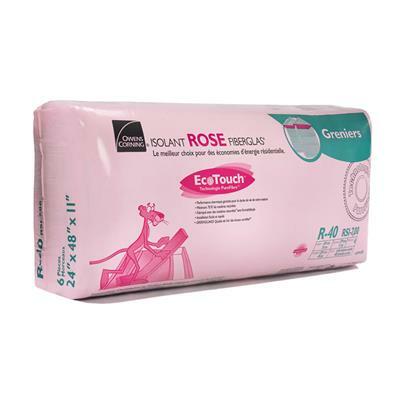 Enjoy the comfort and savings of EcoTouch® PINK® FIBERGLAS® Insulation in your home, while helping save the planet! EcoTouch® PINK® FIBERGLAS® Insulation contains over 73% recycled content,* making us the industry leader in the employment of recycled materials. Even our packaging is recyclable! Plus, EcoTouch® PINK® FIBERGLAS® Insulation is GREENGUARD Certified to meet stringent indoor air quality standards. EcoTouch® PINK® FIBERGLAS® Insulation friction fit batts are easy to install and available in a full range of R-values, R-12 through R-40, offering you outstanding thermal and noise control solutions for every project in your home. *Based on the average recycled glass content in all Owens Corning fiberglass batts, rolls and unbonded loosefill insulation manufactured in Canada. ** Savings vary depending on the original amount of insulation in your home, climate, house size, air leaks, and personal energy use and living habits. ***Made with a minimum of 96% by weight natural materials consisting of minerals and plant-based compounds.